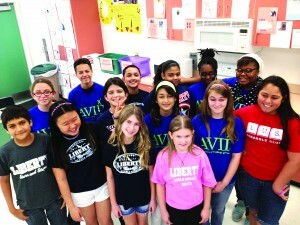 Students at Liberty Middle School in Tampa, recently took part in the week-long ‘Dare to Dream’ campaign hosted by the Advanced Via Individual Determination Program. AVID helps to bring awareness to students about college admissions, and how to be successful in college. The program also helps students improve writing, reading, math and study skills. 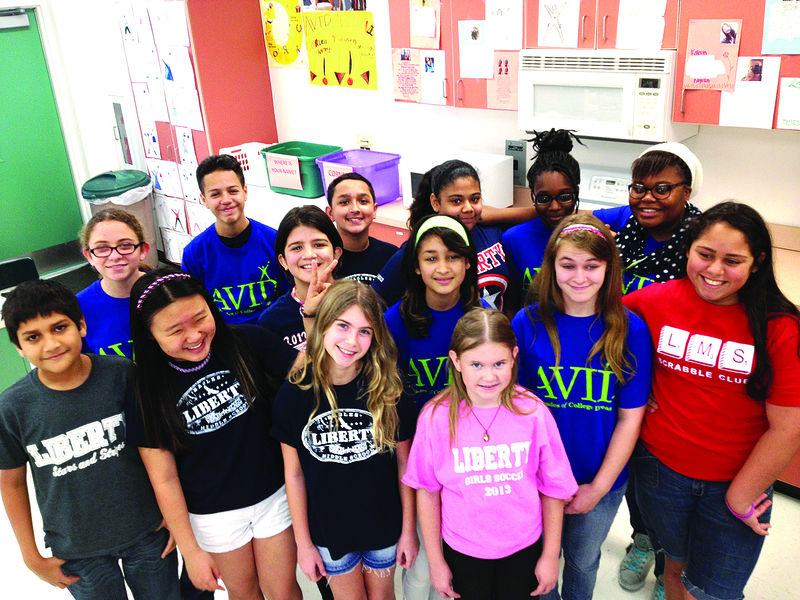 Students wore their school team shirts on the last day of the campaign. Wesley Chapel High School, 30651 Wells Road, will host a free college night in the gym Feb. 24 from 6 p.m. to 8 p.m. Guests can speak to admissions representatives from public and private colleges and universities, vocational and technical trade schools, and the military. For information, call (813) 794-8700. Rasmussen College, 18600 Fernview St., in Land O’ Lakes, will host a free career fair Feb. 25 from 11 a.m. to 1 p.m. The event includes workshops, employment opportunities, and job skill development. Land O’ Lakes High School, 20325 Gator Lane, is offering the Academy of Agritechnology to incoming freshmen. The four-year program will develop skills needed to prepare students for education and careers in agriculture, and food and natural resources management. Applications are due Feb. 28, and can be accessed at lolhs.pasco.k12.fl.us. For information, call (813) 794-9400. The East Side Pasco County Adult Education Program graduated more than 220 adult students on Jan. 30 at the Wesley Chapel High Performing Arts Center. They were enrolled in classes at Moore Mickens Education Center and attended classes at Dade City, Land O’ Lakes, Wesley Chapel, Zephyrhills, Wiregrass Ranch and Sunlake. Pasco-Hernando State College will host “History of African-Americans in Opera” with JoAnne Stephenson Feb. 20 at 1 p.m., at East Campus, Room A-240, 36727 Blanton Road in Dade City. The presentation will offer a performance of select classical compositions by African-Americans. Admission is free. Schools and organizations are welcome. For a schedule of Black History Month activities and locations, visit PHSC.edu/calendar. Pasco County Schools will host an information meeting Feb. 20 beginning at 6 p.m., on Common Core State Standards Initiative. Located at Zephyrhills High School, 6335 12th St., the program is designed to educate parents and the community on the new standards for students from kindergarten through 12th grade. District experts will lead the presentations, and attendees will receive materials explaining what Common Core is. There also will be question and answer sessions. For information, call Linda Cobbe at (813) 794-2717 or (352) 524-2717. The Suncoast Arts Fest at The Shops at Wiregrass awarded more than $8,000 in SAF Grant Awards to teacher and schools at the Wesley Chapel Chamber of Commerce Arts and Business Showcase on Jan. 18. The festival is sponsored by Fine Arts of Suncoast Inc., with proceeds benefiting Arts for Kids in Pasco County. Zephyrhills area schools are encouraging students, teachers and staff to wear black and yellow on the last Friday of each month as part of the “Bee Bully-Free Initiative.” The initiative provides stickers and coloring book pages for schools that request them, participates in the Great American Teach-in, and provides certificates and awards for students who transform from bullies into kinder versions of themselves. Upcoming black and yellow Fridays are Feb. 28, March 28, April 25 and May 30. For information on the initiative, visit Facebook.com/beebullyfree. • March 13, “Learn About Butterflies Day.” Students will enjoy colorful displays of a variety of butterflies and learn the differences between moths and butterflies, the butterfly life cycle, butterfly nutrition, and participate in a craft project.